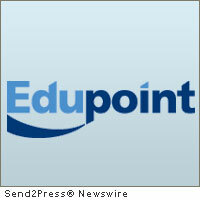 IRVINE, Calif., Jan. 10 (SEND2PRESS NEWSWIRE) — Edupoint™ Educational Systems, a leading student information system (SIS) solutions provider to the national K-12 market, has been selected to implement its newest solution, LessonVUE™ curriculum management, at Mesa Public Schools (MPS). LessonVUE is designed to empower educators and administrators to drive classroom achievement through better management, alignment and analysis of curriculum while providing data to inform instructional decisions. Mesa Public Schools (MPS) is the largest district in Arizona and has earned national recognition for excellence and innovation in public schools. It was named one of the top ten big city districts by GreatSchools.org, and five MPS high schools were honored in the 2010 Best High Schools Search by U.S. News & World Report. Edupoint has long been one of the district’s long-trusted technology partners, providing both its student information management, via GENESIS, and special education data management, via GENESEA, for several years. LessonVUE allows administrators to plan and manage the district’s curriculum, so that students receive a consistent educational experience across all schools and assigned teachers. Using LessonVUE, teachers and administrators create a framework of courses, units, lesson plans, and supplemental materials that can be aligned to state and local standards, enrolled by course or grade levels, and taught by all or a subset of teachers in the district. Through that framework, LessonVUE is able to measure and track student progress and assess the effectiveness of specific curricula and lesson plans, so that, ultimately, teaching strategies can be adjusted to ensure students achieve. Mesa Public Schools has begun implementing LessonVUE within its GENESIS SIS environment. For thirty years, the leadership of Edupoint Educational Systems, LLC, has set the standard for K-12 student information management systems. Their innovative solutions have been used by thousands of schools to manage millions of students. Today, the company empowers a new era of self-sufficient school districts with solutions built on Revelation Technology™, its extensible, scalable, rapid application development platform. Those solutions include GENESIS™, an enterprise-level student information system, and GENESEA™, a comprehensive special education management system. To learn more about Edupoint, visit www.Edupoint.com . Original Keywords: irvine, california news, newswire, mesa public schools information technology, lessonvue, curriculum management solution, student information system, sis solutions provider, rob wilson, school, genesea, saas, curricula and lesson plans Edupoint Educational Systems, LLC Irvine California IRVINE, Calif.
REFERENCES: California Business News, irvine, california news, newswire, mesa public schools information technology, lessonvue, curriculum management solution, student information system, sis solutions provider, rob wilson, school, genesea, saas, curricula and lesson plans Edupoint Educational Systems, LLC Irvine California IRVINE, Calif.